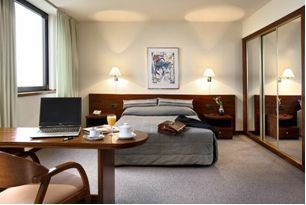 The rooms are bright and elegant, with panoramic views of the city. Fully equipped bathroom (including hair dryer). Lounge with sofa-bed, desk and 2 armchairs in suites. Air-conditioning, SAT TV, free in-room safety deposit box and central heating, telephone, second phone line for data-port in every suite and room service. Currency exchange, airline ticket reservation, car rental, fax and e-mail, cyber corner, laundry, ticket reservation for shows, theatres, opera and musicals. Taxi rank at hotel, catering. 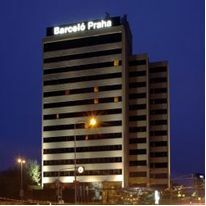 Hotel is located in a quiet residential area, 15 minutes from the historical centre of Prague by public transport. From metro station Budějovická (line C) situated 9 minutes walk away from the hotel take a metro to the station Vyšehrad (3 stops). You can also take a bus no. : 118 or 121 from bus stop Krčská (situated in front the hotel) to the metro station Budějovická. There change for metro and continue 3 stops to the metro station Vyšehrad. Prague Congress Centre is located next to the metro station. The journey should in both cases take up to 15 minutes.